Reprinted from WDBJ CBS on October 13, 2016. It is unattributed. Goodyear is being fined more than $1 million for serious safety and health violations. Four people have died on the job at the Danville plant within a year. The Virginia Department of Labor and Industry’s Virginia Occupational Safety and Health (VOSH) program issued four willful, 115 serious and three other than serious violations and $1,012,400 in penalties on October 7 as a result of comprehensive safety and health inspections. Click here to see the entire news release from VOSH. “Goodyear is committed to the health and safety of all its associates. 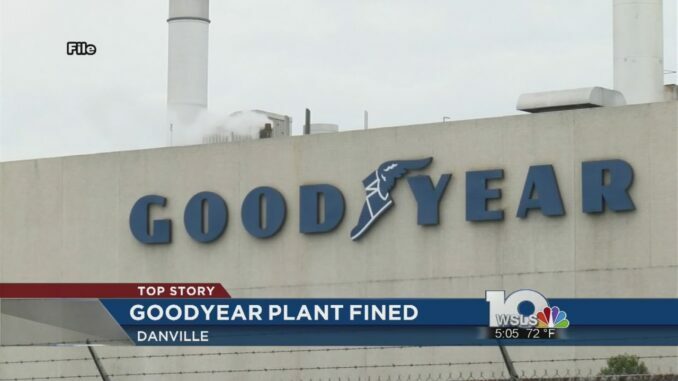 We are reviewing the citations received from the Virginia Occupational Safety and Health (VOSH) program office this week and will work with VOSH and the United Steel Workers to implement any necessary additional corrective actions at our Danville plant, beyond those we have already identified ourselves and are addressing,” Goodyear said in a statement released Thursday.